All in a day’s work? What fun! Just a quickie, and a little peep into the wonderful surprise party that the guys at work threw for Dave and myself yesterday. I knew they were up to something, because they insisted that we don’t get to work before 11.30! But when we turned the corner – well! Talk about overwhelming. There they were, the whole team in a great long line, cheering, blowing bubbles and letting off streamers and poppers. A moment to remember, I can tell you. The buffet was extraordinary, the stencil bunting ingenious, the music superb, and after the initial tears and emotional overflow, we danced around like loonies! Our Mel made us a wonderful “Welcome” Art Piece, which included pretty much every animal in the Clarity Collection! See it in the banner above? Let’s take a closer look at it on Friday, shall we? So yeah. It’s definitely happening now! We even had a practice, cutting the cake which Karen Smith presented us with on Friday!! Tastes fantastic, Karen!!! Many, many thanks to the crew. But now I have to crack on. I’ve figured out a way to hoist my dress up at the back with ribbons inside, so I can dance without somebody treading on the train! I’ve got exactly 2 hours to sort it…. Don’t forget to tune in to HOCHANDA TV at 6pm to watch Paul launch our beautful new FRESH CUT dies. A Sell Out on Telly – and Gracie’s home! Now the celebrations really have started! Wishing you and Dave every nice thing you can think of. And so the countdown continues. I spent the morning making a wedding anniversary card for hubby ready for Saturday. 28 years and counting. Enjoy the start to your journey. 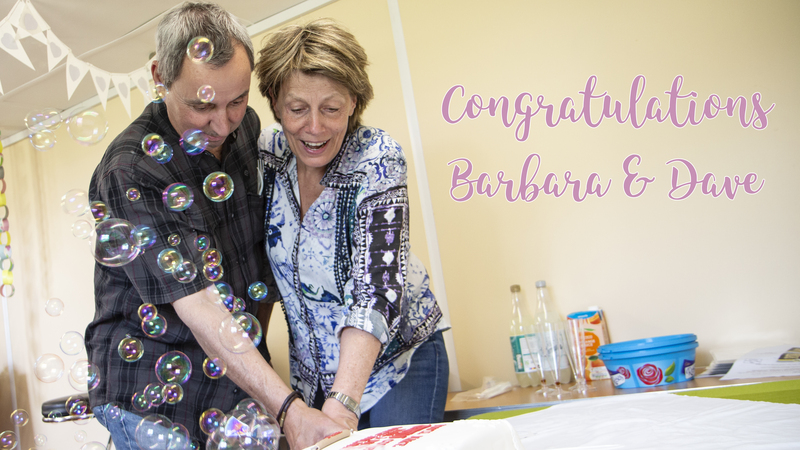 Hi Barbara and everyone, what a wonderful surprise you both had just shows how much your staff think of you both ,it is the same as your customers . A fantastic company , and wonderful people always there to help us along the way. Just watched Paul’s first show , outstanding have learnt a lot in all aspects of stencils exceptional for dies cutting information. Wonderful design team samples not forgetting the dies themselves. It may take a while to get my machine but it will be worth it. Have a fabulous week ,and enjoy ever moment. What a fabulous surprise and the weather behaved itself as well. You certainly have a great team who clearly think a great deal of you both. Enjoy all your celebrations. Not long to go now! What a great start to the week. The fact that your staff went to so much trouble just shows how well thought of you & Dave are as the leaders of Clarity Towers. I am sure you will work out how to fasten your train up so you can dance the night away. Just 4 more sleeps!! Well what a lovely suprise to have when you attired at work. 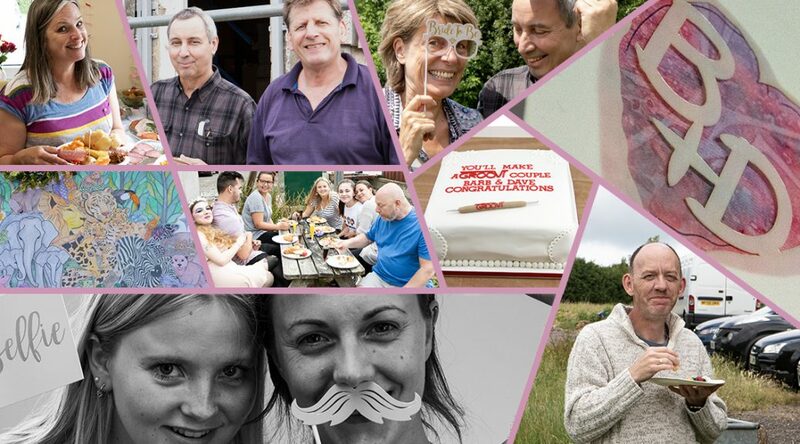 It shows how much your lovely team think of you, it’s more like an extended family than work isn’t it. Looks like you all had a fantastic time. I hope you manage to work out a way to fix your dress, my friend had a similar problem earlier on this year. We came to the rescue with clothes pegs, the only thing to hand at the time. Everyone thought it was hilarious but it worked a treat. I took a sneaky photo and she was so pleased because I was the only one that had thought to capture the funny moment. I’m off to watch Paul on catch up, I hope he’s having sell outs. Ooh! I am getting so excited for you. What a lovely surprise your team arranged and it brought a tear to my eyes, as all these emotional moments seem to these days. I just love to see joy and happiness. And you have a train as well!!! I can’t wait to see photos of the big day. Tomorrow is Thursday and either Mark or Grace is arriving. How are you going to sleep tonight? I am so happy for you and thank you for sharing your happiness with us all. What a surprise but well deserved. What a team!!! Just watched Paul – he’s doing a great job. Another sell-out in the offing so I am glad I ordered my dies and other bits direct from Clarity before the programme started and can’t wait for them to arrive. What a great team you have Barbara. The excitement building and you are going to have a fabulous week leading to the climax on Sunday. 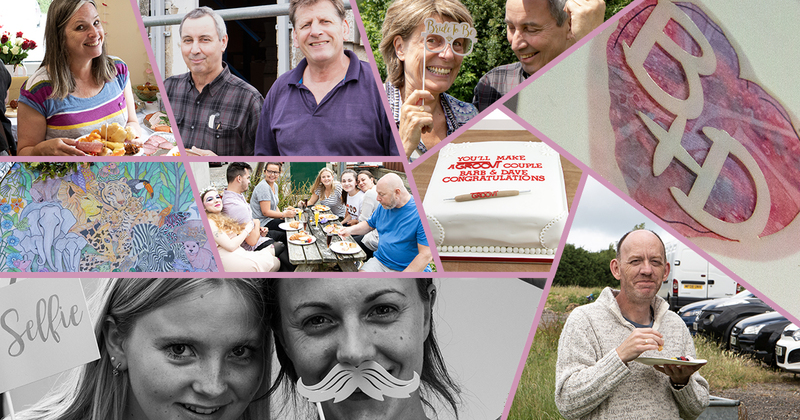 You and Dave are much loved and you are so generous in sharing it all with us. Paul did a grand job at 6pm and gave us lots of tips. What a wonderful way to begin your day at work, and just shows that your team thinks the world of you both. Certainly the best ‘dream team’ I’ve heard of! The countdown to the ‘big day’ is definitely well underway now and I’m sure once Grace and Mark are home the partying will begin for ‘proper’. Enjoy! Saw Paul’s 6pm launch and the dies are lovely but unfortunately a new printer means I must exercise restraint at the moment…roll on Leyburn! Anyway, I wish you & Dave all the very best & I’m sure the wedding will be wonderful. Looking forward to seeing the photos!! Be happy & have a marvellous day & lifetime together. So glad you enjoyed your party. I am neither admitting or denying that I knew anything about it but I am glad the mystery of the missing tablecloths has been solved 😉 .